Men, we haven't forgotten about you! We've got only the best of the best to have you looking and feeling cooler than James Bond. For the groom, groomsmen and gentlemen who crave the best, we're here for you - Bespoke Suits by Barney Cheng. Book an appointment to get started. 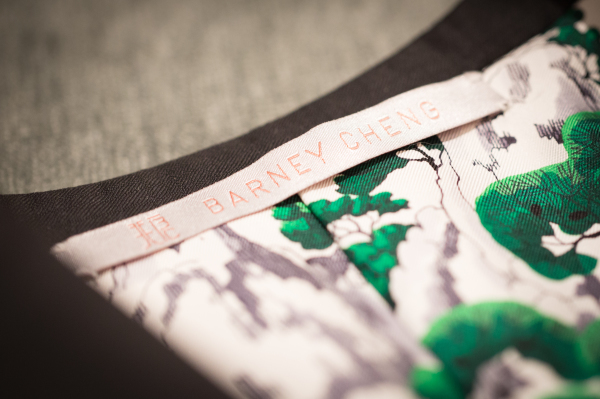 Below is what you can expect of the production process of your very own Barney Cheng menswear creation. Your experience starts at Barney's luxurious studio space. We will have a chance to discuss and decide choice of color and fabric as well as style that best befits you. After confirmation of your design, your measurements will be taken by one of our skilled tailors. The first fitting session is to ensure the correct proportions, look and feel. This session gives us an opportunity to make any necessary alterations and adjustments before moving onto the real fabric. Once amendments are complete, you will have a chance to fit the almost complete garment. Any additional adjustments or changes will be noted to guarantee a sharp and put together look. When your final garment is complete, you can select to pick up at our design studio or have it delivered.